HARRISBURG, October 18, 2017 — State Senate Democrats today blasted President Trump’s latest actions regarding the Affordable Care Act in Pennsylvania and detailed the debilitating impact on Pennsylvanians that his latest acts will have on working families. The president ordered the suspension of an estimated $7 billion in cost-sharing reduction payments that are designed to help lower- and middle-income Americans. He also moved to restructure the insurance market by opening the door to low-cost, high-deductible minimal coverage policies that offer little protection for consumers. As a result, the Pennsylvania Insurance Department announced this week that individual and small group rates under the Affordable Care Act will increase by an average 30.6 percent due to President Trump’s decision to discontinue cost-sharing reduction payments to insurers. In Pennsylvania, 439,000 individuals received health care through the exchanges. More than 321,000 individuals received a tax credit, while 227,304 individuals received cost sharing reduction payments. At a Capitol news conference today, Senate Democrats and House Democratic Caucus Chair Dan Frankel (D-Allegheny) illustrated how the president’s actions will hurt working families. They pointed out that a two-income family of four that earns $100,000 per year and purchases health insurance through the insurance exchange will have a $327 monthly premium increase and a yearly spike of $3,924 as a result of Trump’s actions. State lawmakers met yesterday with the Pennsylvania Insurance Department and four major health coverage providers to discuss steps to mitigate the pain on consumers, many of whom are working class and job creators, according to state Sen. Sharif Street, the Democratic chairman of the Senate Banking and Insurance Committee. Street also warned that Trump’s efforts to roll back an Obama Administration ruling on types of employers that can form and offer “Association Health Plans” (AHP) under the Employee Retirement Income Security Act (ERISA) will destabilize the insurance market for everyone and loosen regulations, which will make it more difficult for the government to protect Pennsylvanians. “It’s our job as elected officials to protect Pennsylvanians’ rights. This plan will take away our ability to do that effectively and will destabilize the market, which will impact us all,” Street said. 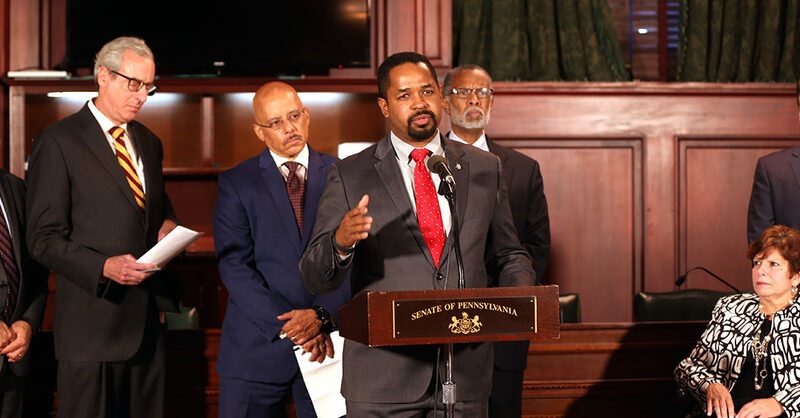 Senate Democratic Appropriations Chair Sen. Vincent Hughes (D-Philadelphia/Montgomery) noted that Pennsylvania Senate Democrats have long fought for innovative and comprehensive health care programs, including the CHIP program, which Pennsylvania was the first state to implement. State Sen. Art Haywood (D-Philadelphia/Montgomery) said the recent roll back of comprehensive reproductive health care “is wrong,” noting that religious policy should not dictate public policy. Also attending today’s press conference were state Sens. Larry Farnese (D-Philadelphia) and Tina Tartaglione (D-Philadelphia).